Giving Thanks for a Response! make the distance apart seem closer. A few weeks ago, I shared bucking-expectations with you which was about my sending a sympathy card to my cousins with whom I hadn’t spoken in years due to family troubles. I sent my heartfelt message to them with love, hoping for a response, but being ok without one. So, last week when I finally got my mail, tucked in the pile of junk mail and bills was a white envelope addressed to me ~ from my ‘older sister’ to whom I’d sent the card. She sent me a beautiful card of sympathy, acknowledging the death of my father (as I had acknowledged the death of her Mom). She even included a sweet story which I had never known about something my Dad had done for her. She told me that I would always be in her heart as well which is what I had told her. It was, for me, a bittersweet moment. All those years wasted and yet, a hope for reconnection. The above card looks perfect to me and I am sending it to her and to her family. I haven’t seen them for 13 years ~ her children are grown, she’s only met my older son when he was little because the last time we saw each other was her dad’s funeral. Her brother has not responded and I am ok with that as well. I wrote from a loving heart so whatever happens is not my concern. There was a message that I had longed to send which I did. I told them both how I missed them and how much they had meant to me. I don’t believe I am alone in this situation. Perhaps you as well have relatives or friends with whom you’ve lost touch…and it’s awkward to call after so much time for reasons beyond your control. That’s where sending a card can be a blessing ~ besides the fact that you can say whatever you want, you can reach out and touch the heart of another person…without fear of verbal rebuttal. 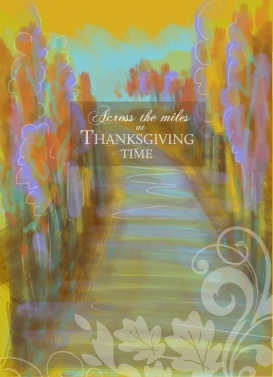 Thanksgiving is around the corner…a time for family and the beginning of the holiday season. SendOutCards has a ton of cards to choose from and they cost only about a $1 plus postage…write your own message and press SEND…it is so easy to reach out! Click below to send a card today! Give it a try ~ you never know what could happen! what a wonderful outcome and I’m so glad you received a response from your “older sister”. Who knows, you may still receive one from her brother. So glad your “older sister” replied to you in such a caring way.